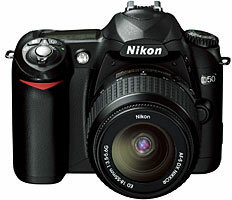 DPReview’s Nikon D50 review was released this saturday. It starts with a comparison with the D70/D70s which shows some nice enhancements like an additional AF mode which switches automatically to continuous mode. Also using the command dial for image browsing is a nice addition. Two new kit lenses are supplied which both have AFS (Silent Wave Motor). It seems that Nikon will upgrade all future lenses to incorporate AFS. The most amazing result to me was that the D50 produced much clearer images at any ISO level. Even better that both Canon 300D and 350D. The results at ISO 200 can be compared with ISO 100 at the Canons. So the image sensor is probably different from the D70 as I can believe this can be done with firmware only. My feeling is that the D50 will do as good as the D70(s). Maximum speed of half a frame less won’t be a serious problem. I won’t miss a DOF preview button as I never use it on my F80. Same is true for White Balance fine tuning, It is a nice feature but I won’t miss it The only thing which I currently doubt is the SD cards as I have now approximately 800MB in CF card storage and none really available in SD format (or I should cripple my TomTom GO). I would also not go for the kit lens.